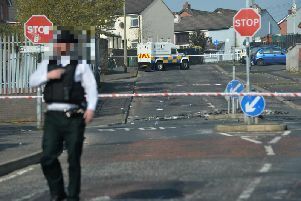 George Hamilton has quoted an extract from the Old Testament in an interview with The Irish Catholic, saying that it highlighted the qualities of “a good cop”. The PSNI chief constable said that the religious faiths held by many officers “tend to coalesce” with “what makes good police work”. The Irish Catholic describes itself as a weekly paper with a circulation of about 30,000, adding that it is “sold in almost every church by an army of volunteers”. The George Hamilton interview was conducted by Martin O’Brien, and is published today. His predecessor Matt Baggott has in the past spoken about his own Christian faith, and is today the president of the Christian Police Association. Mr Hamilton was quoted in The Irish Catholic as saying that faith and carrying out the duties of officers are “not in any way inconsistent”, and that he does not want police officers “to be so neutralised that they are devoid of any personal belief system”. He told the weekly newspaper that he is “from a non-denominational group”. However, in the published article he does not state which one it is (although he does confirm it is a Christian group). “There is a passage of scripture from Micah [6.8] which talks about what God requires of us,” he said. The New International Version of scripture renders this as: “He has shown you, O mortal, what is good. And what does the Lord require of you? Mr Hamilton said heeding these words – and the values of justice and compassion – can “make a pretty good cop in my experience”. “You don’t even need to be Christian to have those things,” he said. Asked if these words from The Book of Micah had “ inspired him in his own policing and human journey”, he said: “Yes ... it will be different for everybody by the way. “I wouldn’t be advocating this as an organisational position.